My name is Heather Loubier and I LOVE my German Shepherds! Yes, I have two. Let me introduce them to you. Lexi was born 3/9/2010, so her 1st birthday is coming right up. My husband and I have had her since she was a puppy. She is a wonderful dog! She is very playful and very cute. People say one of her best characteristics is that one ear is floppy while the other ear is straight up. Lexi usually makes people laugh with her silly behavior. She loves the snow and tries to throwing it up in the air and then trying to attack it before it hits the ground. She enjoys summer as well. She tries to make friends with everyone and everything, including bugs. Lexi loves going for boat rides too. Tazer had a very difficult first year of her life and we wanted to change that. We knew that Tazer would take a lot of extra care, love and work. Now that some time has passed, I couldn't imagine anything different. Tazer has come a long way and Lexi LOVES having a "sister" or playmate. One of the things I had to teach Tazer was that is was ok, and how to, play. At first, when Lexi would try to play with her she didn't know what to think of it and got very defensive. Now, they play together all the time. My husband and I walk the nature trails frequently, which is one of the girls' favorite outings. Let me explain the picture I sent of Lexi in the bathtub. 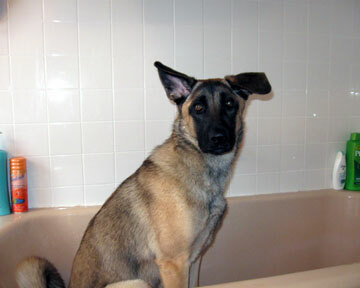 When Lexi was a puppy, she would come into the bathroom every morning when I would shower and lie right beside the bathtub. As she grew older, she got more curious. She starting jumping in the bathtub when I would get out from my shower. I soon realized that she loved the scents of my shampoos and soaps. Now, she doesn't even wait for me to get out of the shower! It is not unusual for me to open my eyes after shampooing my hair and have Lexi sitting right in the bathtub with me! When this first started happening, I was very surprised and thought it was funny. I had never heard of any dog doing this before. However, when I am going about my morning routine, I still find this comical and wanted to share it with other GSD Lovers! I hope you are able to upload this picture. I'm not quite sure what "600 X 600" means. If for some reason, you cannot upload it, please explain to me what those numbers stand for and I will try to adjust my pictures so you can view them. Thank you so much for this opportunity for me to share my girls with other GSD Lovers! I know myself, I love visiting your website and seeing other beautiful German Shepherds! Heather you did a great job with the girls!! (Ben Too) This site is really nice! I bet it's awesome seeing Lexi in the tub with you, She's soo cute! Thanks for sharing your story it was awesome!!! I love the tubby story! I don't know how I would react if I opened my eyes in the shower and there sat my dog. They truly do become part of the family. We love your girls!